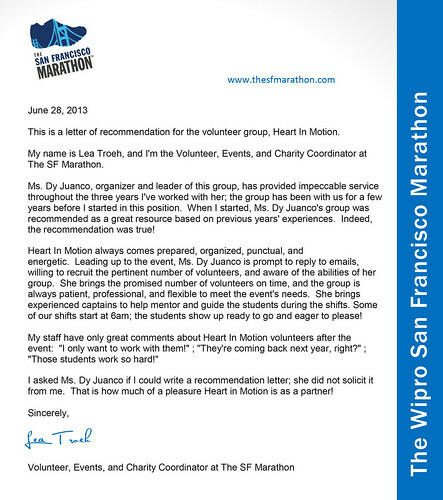 Heart in Motion received a heartfelt thank you letter from SF Marathon Volunteer Coordinator. The teens helped stuffed 1500 goodie bags in a manner of 2 hours. In assembly line fashion the team of loaded 125 juice cases, 65 cases of water, and various items here and there. They might have broken a sweat, but their morale and spirit stayed strong. They were dependable, reliable, and always willing to help. With their fearless leader Calvin in tow to guide and help them throughout. Thank you again for you and your youth’s contribution! I want to thank you so much for offering the services of your volunteers to me. They were the best volunteers I have every had. They were responsive (answered the emails I sent promptly), punctual, neat, happy, and incredibly hard workers. Nothing I asked was too much trouble! I look forward to working with Heart In Motion in the future. It was a privilege! Thank you so much for your assistance in recruiting volunteers to help at the San Francisco Symphony’s 2012 Deck The Hall. The event was a huge success in large part from the efforts of your volunteers. They arrived on time and were ready and willing to take any assignment. The San Francisco Symphony’s Junior Committee members were very happy and impressed with your group. Thank you again for all your help. We look forward to working together again next year! The SF Flute Festival was a big success thanks in large part to the volunteers from HIM! They were warm and friendly, took their jobs seriously, with smiles and willing attitudes, and caught on to our procedures quickly. When one who had signed up was unable to attend, they coordinated with each other so another filled in. They truly saved the day when two of my key volunteers were unable to attend due to illness. In a word, they were great! We couldn’t have managed without them!! I look forward to working with HIM volunteers in the future. Thanks, everyone! We at the San Francisco Botanical Garden would like to express our heartfelt gratitude for the truly significant help provided by Heart in Motion. On Friday the group of volunteers showed up promptly and were extremely helpful and did a fantastic job. They worked in will call with Naomi our team leader there. She reported that her volunteers were fantastic, smart, quick to learn and hardworking. Diane, our nursery manager had nothing but praise for the group who helped out as tag pullers, she also remarked on how smart and hardworking the volunteers were. I worked with a group loading plants and checking receipts and they were equally wonderful. On Saturday, the HIM team helped out at our upper nursery getting it ready to receive the plants not sold at the sale. They worked with Diane and again, she had nothing but praise. She was absolutely thrilled with the help that HIM provided. Thank you all so very, very much. HIM volunteers were really a tremendous group and I can’t say how much I and all of us who worked on the plant sale appreciated their help. I hope we can call on you again next year for the plant sale. And I hear that Hear in Motion is coming back to help in our Children’s Garden. Thanks for your support. WOW! If I could only use one word to sum up our recent experience with HIM volunteers — it would simply be “WOW!” What a wonderful, well organized and enthusiastic group. HIM recruited and organized over 85 teens to handle almost the entire Postrace Expo for our annual Run Wild For A Child event benefiting the San Francisco Fire Fighter’s Toy Program. They showed up on time, ready and willing – and their enthusiasm was palpable. We received so many compliments from participants about their overall experience — and, much praise from our postrace supervisors who were quite impressed with how great the volunteers were. Thanks so, so much for all your hard work on this event — past events – and hopefully many future events! Even though I’m not the chair of Multi Cultural Night (though I helped with food set-up and serving) I want to say….HIM did it again! They ROCK! Thanks soooooooo much to everyone who volunteered. They helped tremendously…great attitudes, initiative, knew what to do with little instruction once again. They’re the best! I just want to take a moment and thank you and every young adult who helped us prepare for our Toy and Joy distribution. It went well. I do not know what I would of done with out your help. I had a great time working with you and your group. Because of you we were able to serve 1,197 families and 2,684 children. You should have seen them as they selected their gifts. It was wonderful. I could not believe the amount of work you guys accomplished in such a short time. I would love to have your group come back and help us once again. I hope your time here is as fun for you as it was for me. Thank you so much for HIM’s assistance in recruiting volunteers to help at the San Francisco Symphony’s 2011 Deck the Hall. It was a delight to work with such an organized, dedicated and enthusiastic group of teens. They arrived on time and were ready and willing to take any assignment. The event was a huge success in large part from the efforts of the fabulous HIM volunteers. Thank you again to HIM and please pass along our sincere gratitude to each of the volunteers! HIM provided Lafayette Elementary School’s Autumn Carnival with 45 of the most incredible volunteers to man our games and various activities. I can’t thank you enough for the privilege of using them! Our carnival would not have been the smashing success it was without them! Not much instruction was given but the volunteers were able to take initiative and work under the blazing sun for almost the entire day! They were so responsible and had the best attitudes. Our children thoroughly enjoyed having high school students work our games & activities; it was a great combination, young people helping younger. Our parents raved about them; they were so impressed with their hearts in serving our Lafayette community. We absolutely want and need to have HIM volunteers come back to help us for all our future carnivals! If you have an event you need capable, enthusiastic and responsible volunteers, I highly recommend contacting HIM. Thank you, thank you, thank you HIM… you ROCK!!! Thank you for the help and for the kids on Saturday. They were a big help. It was nice to see kids volunteering and taking an interest in what they are doing. I don’t see that very often with volunteers! I wanted to send over a quick note to thank you from the bottom of my heart for being at the Taste of South Beach/Mission Bay Food Festival this past Saturday to support Open Hand. It totally brightened my day (as usual) working with you and your students during the fair and I hope you know how incredibly grateful and lucky I feel to have your support. It’s so heartwarming to have people like you in my life, out there dedicating your valuable time to help POH. Thank YOU for providing such wonderful volunteers. They were enthusiastic and were very, very, very helpful. Please pass on my gratitude to them once again. It was wonderful to meet all the volunteers – having amazing volunteers like you really made my first event at Open Hand much less stressful and more fun! Thank you! They were such a pleasure to have them all and I am so incredibly grateful for your support and commitment to Open Hand, you are a rockstar! 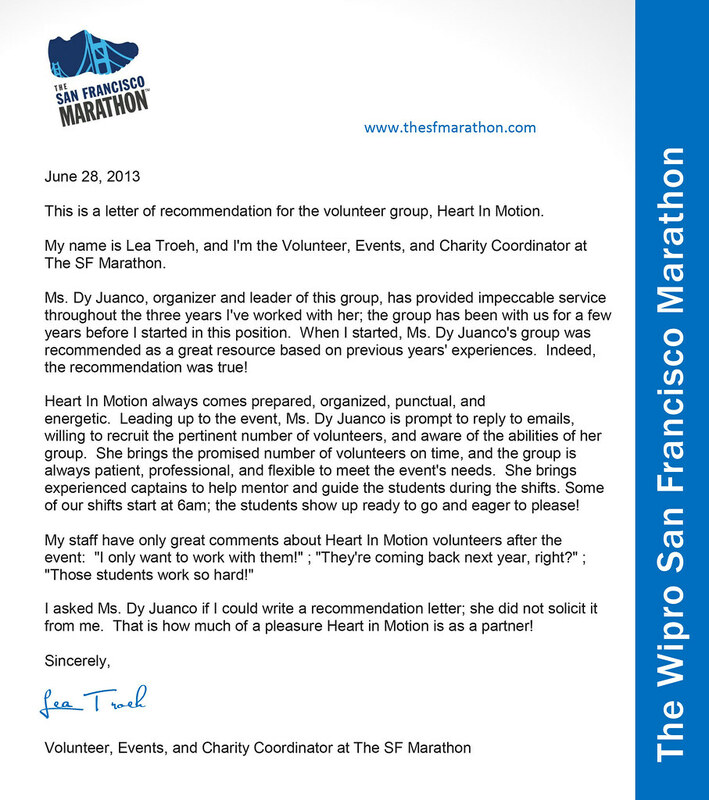 Heart in Motion made The SF Marathon run very smoothly. Their organizer Sandra pitched in wherever and whenever needed. She rallied large numbers of quality students to work in many areas of our 25,000 person event! Her kids received many compliments, even from the police chief! Heart in Motion came as a unified group and they were always punctual, cooperative, and helpful. I’d recommend them to other events organizers, for sure! The student volunteers who worked the Annual Plant Sale on Saturday, May 6 did a fantastic job! The Annual Plant Sale is the largest plant sale in Northern California with over 20,000 plants for sale. There were probably 1000 customers who came through during the time they were volunteering. We did not have a single complaint or have any miscounted plants. They were also fun to work with. The team was great and worked hard to help us prepare our John Muir Nature Trail, for our summer Acorn to Oak Program. Through there efforts we were able to create new paths and complete in one day what would have taken our team a whole summer. The teens worked well with our summer interns, and completed many tasks together as a team. We pruned back some over grown bushes, and branches. We weeded out large areas to create new paths and work areas for the kids to use in our summer program. Once again I want to thank you for sending such a great team our way.